DCU Athletics after their success in Maynooth. 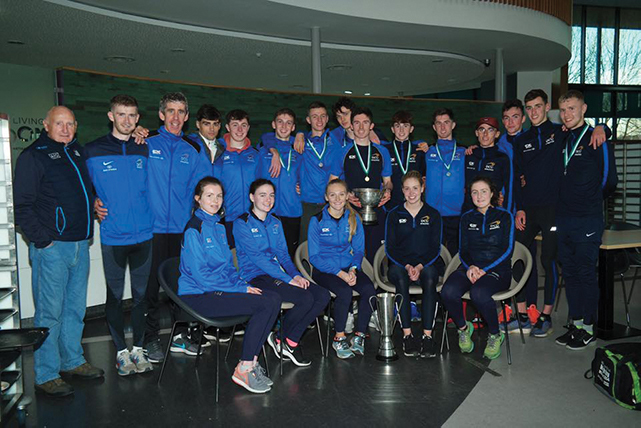 DCU Athletics had another strong showing at the 2018 Irish Universities Road Relay Championships in Maynooth. The college had five women’s teams competing that finished in the top ten, coming in 1st, 4th, 6th, 7th and 10th, with the winning team setting a new record for the course since it was changed in 2015. The men’s teams finished in first, second and third with the fourth team finishing just outside the top ten in 11th. The phenomenal result for DCU in the men’s race is the first time a college has been present on all three steps of the podium in the Road Relay. Michael Carey, who ran the DCU ‘B’ Team that finished second, was ecstatic with the performance of both teams. Carey also recognised the significance of what the men’s team had achieved. “This has never been done before by DCU or any other college and is a massive triumph for the college,” he said. It was more than just the athletes who travelled to support those competing that Fitzpatrick had to thank, though. “Thank you to their coaches, our club supporters, loads of parents travelled to the event and they witnessed a historic day for the college. Fitzpatrick was also optimistic for some of his athletes that have a chance to qualify for the European Cross-Country Championships in Tilburg in The Netherlands. Athletes compete in the National Cross-Country Championships in the National Sports Campus in Abbotstown on November 25th for a chance to make the team and travel to Tilburg to represent Ireland in Senior, Under 23 and Junior levels. Many of the men’s team, including Brian Fay, Andrew Coscoran and Conor Duncan will be hoping to make the senior team, according to Fitzpatrick, with others like Jamie Battle and Cormac Dalton also looking to make the trip to Tilburg. On the women’s team, athletes such as Avril Deegan, Una Britton and Emma O’ Brien will also have a chance to impress at the National Cross-Country Championships in Abbottstown in order to book a ticket to the Netherlands.